It is actually quite remarkable that not every spam filtering solution includes an outbound spam filter by default. An outbound spam filter should be a consideration in the evaluation of any anti spam solution as it prevents your IP address being blacklisted by mistake. How could your IP address be blacklisted? Easily. An email with a misspelled title or the overuse of spam-related keywords or characters (“!” or “$” for example) could be identified as spam by an over-zealous spam filter. If enough over-zealous spam filters report your IP address as a source of spam, it could be added to a global blacklist. The global blacklist is shared between all major spam filtering service providers. This means that all your organization´s emails would be caught by their recipients´ email filters, and only delivered once your organization´s name had been added to a whitelist – or removed from the global blacklist. And that´s not all. If your email server and your website share the same IP address, access to your website could be blocked by web filters using the same global blacklist. If you rely on your website for attracting leads or online transactions, the consequences to your businesses of being blacklisted could be substantial. Removing your IP address from a global blacklist is not difficult, but it can be time-consuming. All the time your organization´s IP address is blacklisted, the flow of communication between your organization and its customers is delayed – potentially harming your organization´s profitability. Your “IP reputation” is a contributing factor towards whether your emails are considered to be spam. There are a number of online resources you can use to find out if your IP address has a good, neutral or poor reputation. Once you have conducted a test, you will be in a better position to determine whether or not an outbound spam filter is required. The blacklisting of your organization´s IP address may have occurred due to a perfectly innocent email, or there may be more sinister reasons behind it. Possibly an employee within your organization is using his or her corporate email address to send out bulk email for their own financial gain. This is not only an abuse of their email privileges, but could also reflect badly on your organization. If word was to circulate that your organization consented to – or failed to address – the use of its email for spam, that would not only harm your organization´s profitability, but also its credibility. Another reason why your organization´s IP address may be added to a global blacklist is if an outbound email is found to contain malware. The malware may not have originated from your network, but could be within an attachment prepared by an employee on his or her malware-infested home computer. An outbound spam filter will prevent all these potential scenarios from occurring. It scans all outbound emails for both spam and malware, and blocks any that may result in your organization´s IP address from being blacklisted. The reports compiled by your spam filtering solution will alert you to any emails held in quarantine awaiting your action. All spam filtering solutions compare the IP addresses of inbound emails against a Realtime Blackhole List. A Realtime Blackhole List is another name for a global blacklist of known spammers and is updated as new sources of spam are identified. However, this is only one of the checks performed by advanced spam filtering solutions. More advanced spam filtering solutions – those with higher spam detection rates – use Bayesian Analysis and Greylisting to identify spam from previously unknown spammers. If advanced filtering solutions identify outbound emails from your organization as spam, your IP reputation will suffer until it reaches a point where the IP address is added to the Realtime Blackhole List. As mentioned before, it only takes a misspelled title or the overuse of spam-related keywords or characters for your IP address to be blacklisted. Bayesian Analysis is one of the mechanisms used in an outbound mail filter to ensure your organization´s emails are free of spam. Most advanced spam filtering solutions will also use antivirus software when scanning outbound emails to ensure they do not contain malware or links to malicious websites. SpamTitan offers the most advanced and effective spam filtering solutions available. Although advanced, they have been specifically designed for ease of use and low management overhead. Our spam filtering solutions scan both inbound and outbound emails, and use Bayesian Analysis to detect 99.97% of inbound spam and 100% of outbound spam. Our solutions include dual antivirus protection from Bitdefender and ClamAV, and ensure email continuity in the event of downtime due to a server outage or natural disaster. Management of the solutions is conducted via an online platform that can be accessed from any Internet-enabled device, allowing system administrators to configure their own filtering, monitoring and reporting settings. SpamTitan Gateway is a powerful software-based filter that is deployed between your organization´s mail server and your firewall. SpamTitan Gateway supports multiple domains and an infinite number of users. SpamTitan Cloud is a versatile cloud-based spam filtering solution that is equally as scalable and has one of the best spam catch rates among the market leaders. SpamTitan Cloud can be hosted in our cloud, in a Private Cloud or within your own infrastructure. Managed Service Providers interested in providing their customers with a filtering solution that includes an outbound spam filter will be interested to learn that both SpamTitan Gateway and SpamTitan Cloud are available in white label format. We can also supply a range of APIs to integrate our advanced spam filtering solution with third-party management products. 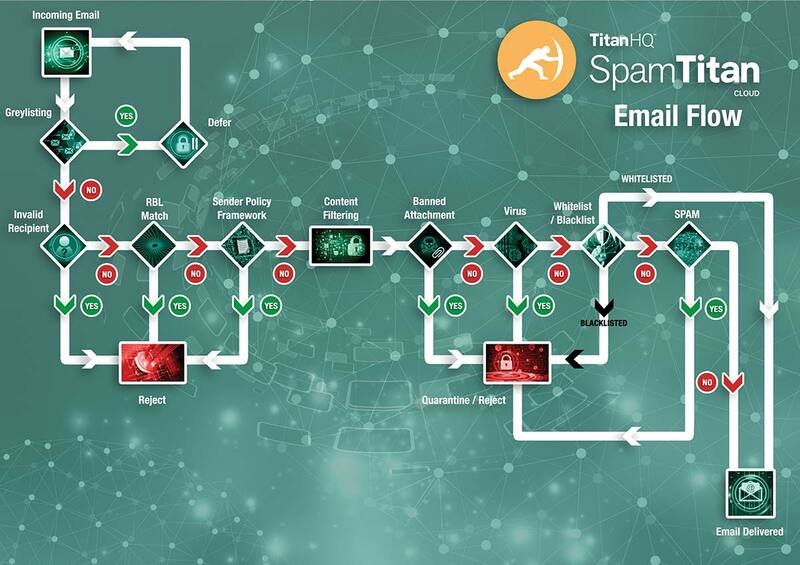 If you have never used a spam filtering solution with an outbound spam filter before, we invite you to try SpamTitan free for thirty days to see what impact it makes to the volume of spam email you receive and the malware that is prevented from infecting your network. An outbound spam filter is included as part of our offer, as is full customer and technical support. Although only a precaution against spam emails and infected emails being sent out from your organization, you might be surprised exactly what is detected during your trial period. Call our team of Sales Technicians today to find out more about our offer. One of our team will be happy to answer any questions you have about the benefits of an outbound spam filter and guide you through the process of installing and configuring the most appropriate SpamTitan solution for your free trial.